A Walt Disney World worker who was acquitted of charges he fondled a 13-year-old girl while dressed as Tigger has been suspended again, accused of shoving two people while in a Goofy costume. His lawyer said the man was just "goofing around because he was Goofy." Two photographers at Disney's Animal Kingdom said Michael Chartrand, a native of England, came up to them in his Goofy costume and shoved each in the chest, Orange County Sheriff's Capt. Bernie Presha said Wednesday. The photographers, a male and a female whose names were not released, work for Kodak at the park. Disney spokeswoman Jacquee Polak said Chartrand was suspended Aug. 30 and would remain so indefinitely. Chartrand also could face misdemeanor charges. Jeffrey Kaufman, Chartrand's attorney in the Tigger case, said the new claims were bogus. 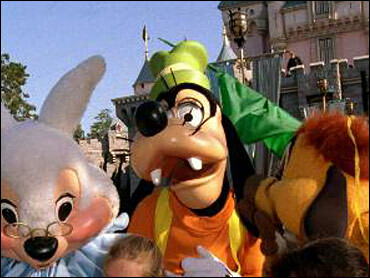 "Goofy is always playful," Kaufman told the Orlando Sentinel. "Of course he was goofing around because he was Goofy!" Earlier this year, Disney suspended Chartrand after a 13-year-old accused him of fondling her while he was dressed as Tigger. A jury acquitted Chartrand of those charges, and Disney let him return to work Aug. 6. Kaufman said Disney sees Chartrand as a liability and is using a false claim against him. He also said the two Kodak employees shoved Chartrand back, as part of routine horseplay among cast members and greeters meant to entertain patrons. "That's the joke about this," Kaufman said. "You're supposed to fool around, be animated. I knew for Michael it would be tough for him to go back. I told him he would be a walking bull's-eye." Chartrand, 36, had been living at his sister's home in nearby Kissimmee but was not there Wednesday. His sister, Fran Chartrand, referred all inquiries to Kaufman.